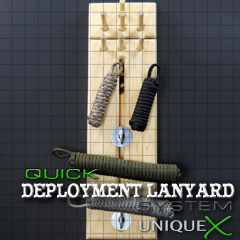 ITS Tactical created a tutorial on their Paracord Deployment Lanyard which is a great way to have a lanyard that holds extra paracord and can be unraveled in seconds. To deploy the lanyard, hold the coiled section in one hand and give the loop a firm tug, once it comes out, keep pulling until you have one long strand of paracord. 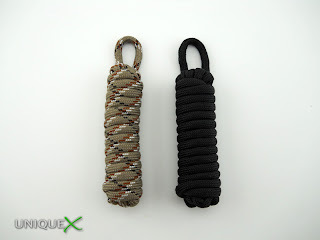 I found this design really easy to tie and is really easy to use, but if I was going to be tying many different length lanyards, it would need to be more uniform than tying it in hand.That's when I thought about using one of my Paracord Jigs to tie this design. I found that in tying a longer length lanyard, it would require more than two dowels for the loops to look right. 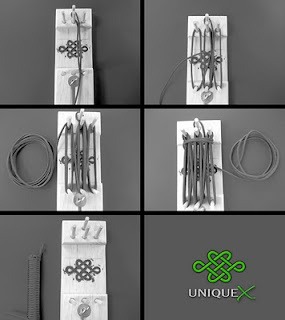 I then decided to build another type of jig that would work for tying this design. A Jig isn't required to tie this lanyard with straight symmetrical loops, but I do prefer using one. 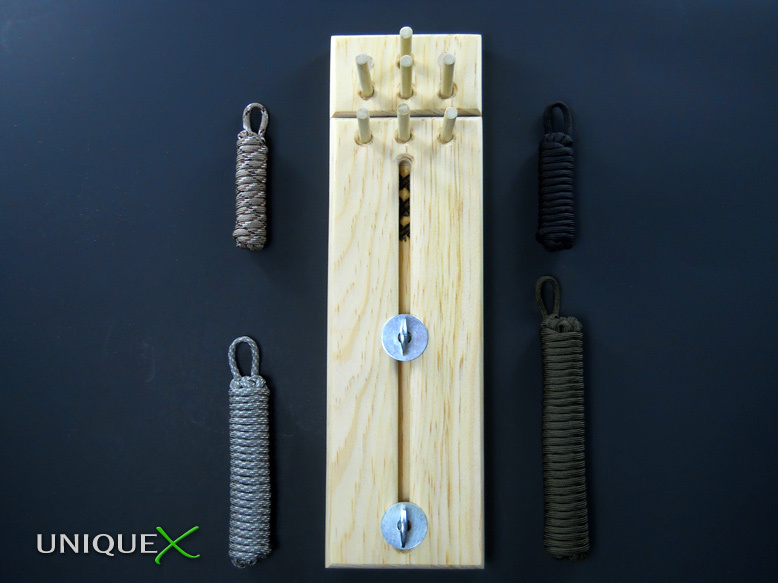 You can produce the same result as with a Jig by using a few long nails (or screws) and a short board (or stump). The board will need to be as long as your intended lanyard length will be and the nails should be at least two inches long. Once you have the materials, place the nails in the same manner as shown in the images of my Jig. To keep this post from being too long, I have decided not to include instructions on building the jig. If there is demand for the specs on the jig, I will include them in a future post. For now, here is a photo tutorial on using the jig to tie this design (please excuse my first attempt at wood burning my logo into the jig). I added multiple dowels for longer lanyards, one or two dowels may be used for shorter lanyards. If you are going to build the jig, it's fairly straightforward, it uses one 4"x36" length board and a dowel (I can't remember the diameter of the dowel I used, you want to use the smallest diameter that will be sturdy at about three inches long and won't break). To secure the slider, I used two Thumb Screws and two Pronged Tee Nuts that are inserted into the backside of base board. Then all you need to do to build it is cut the three pieces and then use your router to cut the slot and then you're finished. Start by using your lighter to attach the strand to the other strands, this doesn't need to be thoroughly melted to the other strand, it just needs to hold. Wrap the loop around the top dowel and begin looping the strand around the other dowels. Continue looping around the dowels until you have about five feet of cord remaining. 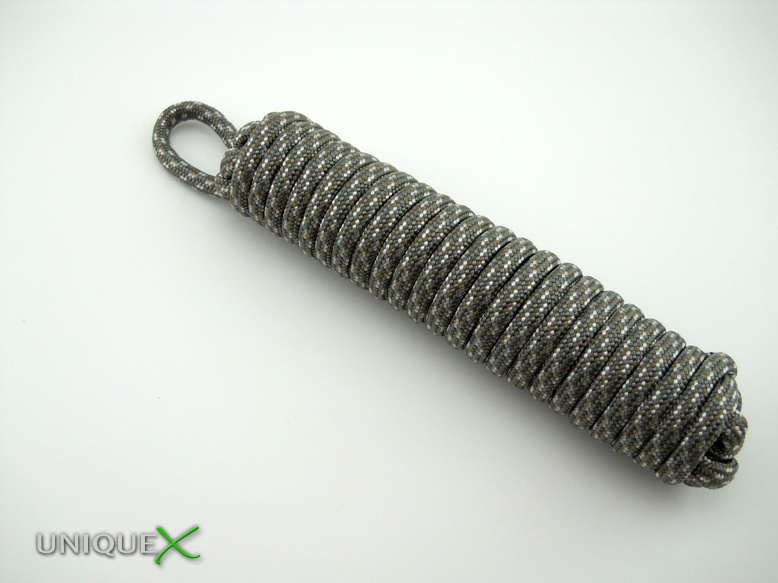 Make a few wraps around the vertical loops to hold while removing the paracord from the jig. 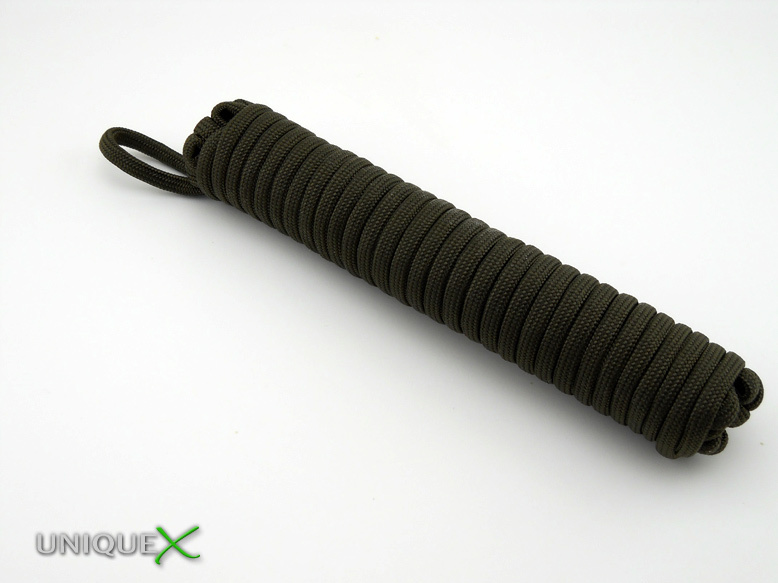 Lift the paracord off the jig while holding the loops tightly. 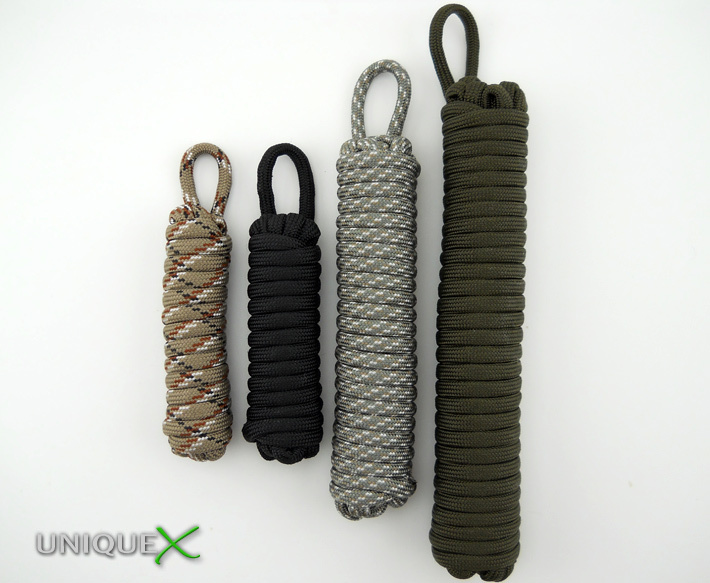 Start wrapping the paracord around the full length of the vertical strands until you reach the bottom. Insert the strand underneath and through the last section. 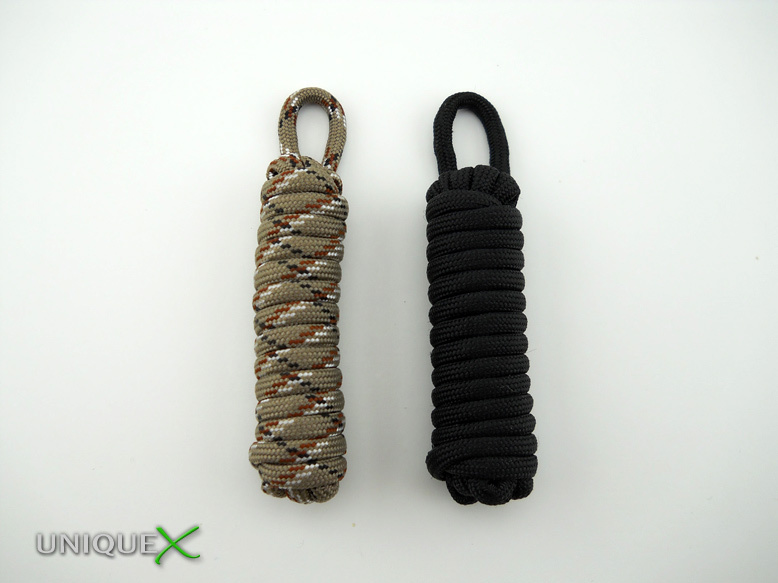 Cut and singe the end of the paracord using your lighter. You will notice that by lowering the jig, you can adjust it for tying longer lanyards that are uniform in length each time you tie it. If you removed the top screw, you could tie a really long lanyard. A quick question about the wrapping pattern (steps 2 & 3) - I can't quite follow the pictures. If you number the pegs (1, 2, 3 across the top and 4, 5, 6 across the bottom - like the charts available for tying turk's heads), is the pattern start at 2 ... 6 ... 3 ... 5 ... 1 ... 4 ... back to 2 and repeat? There is no real pattern that I went by, I tried to keep it equal though. Say I was going to be using three of the pegs, I would want to try to end up with equal loops for each of the pegs and if the cord length was shorter, I would only use two of the pegs and then equal those out. I hope this answers your question, but if you wanted to do it exactly as I pictured let me know and I'll get you the photos of closer views. @Pete I wanted to add that the pattern you stated is the way I try to run the cord. Thanks, Chad. That helps a lot. I've got a bunch of paracord and I think this would be great way to store it for quick, tangle-free use. Keep up the great work on the site. Its one of my favorites.